Join Us in the Read Aloud Campaign! 15 Minutes. Every Child. Every Parent. Every Day. Imagine the future if every child were read aloud to for 15 minutes every single day. Partnership for Children of the Foothills wants to partner with you and Read Aloud. We are participating in the Read Aloud 15 Minutes national campaign because we believe in the importance and power of early literacy efforts. Why? Research demonstrates that by age three, a gap is showing up in early brain development between children whose parents read and speak to them and those who do not, because it isn’t just baby’s body that is growing during these early days —the baby’s brain is developing even more rapidly! Parents are a child’s first and most important teacher. Begin your child’s journey of learning today. Give your baby the best start by reading aloud every day, for at least 15 MINUTES, right from birth. More than half the children in this country – 13 million children – will not hear a bedtime story tonight. Pledge to help us improve the literacy of every child in our area, starting with yours! 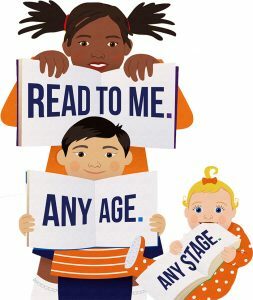 Complete the form to sign up for our monthly newsletter and start getting FREE resources and gifts just for committing to read to your child. You’ll receive literacy resources and gifts, such as: reading trackers, book lists, information on upcoming events, and offers for items you can enjoy with your kids. I learned new information today about the importance of early reading aloud for my child, or for children in my care. I’m committed to reading aloud 15 minutes a day with my child or children in my care. Mrs. Western Carolina America, Sheena Gabbard, shares why reading aloud 15 minutes a day is critical to early literacy and the success of our youth. Accelerates your baby’s brain development, nurturing trillions of new connections from birth. Exposes your baby to millions more words by age 4. Builds critical literacy skills like vocabulary, phonics, and comprehension. Prepares your child for success. Reading from birth to age 8 gives your child lifetime learning skills. With support from NC Smart Start Initiative, Partnership for Children of the Foothills provides programs for children ages 0-5 and their families in the areas of Child Care/Education and Family Support in McDowell, Polk and Rutherford counties. The Partnership for Children builds and sustains relationships with community agencies and service providers, offering creative and unique programs for young children and their families, licensed child care centers and family child care homes. Please take our quick quiz about the importance of reading aloud to children. Must reside in Polk, Rutherford or McDowell counties.